It seems Globacom has chosen this free data day stuff as every month and it looks like a working method for them to acquire more subscribers to their network because this is the third time they are doing this. 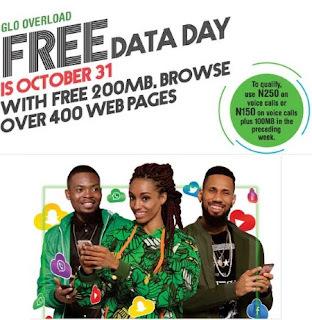 The third Glo free data day will hold on October 31st, 2017. All Glo customers who meet the set threshold will enjoy 200MB, plus free chatting on WhatsApp all through the day. According to Glo: "All Glo customers can now enjoy a whole day of free data when they meet set of voice and/or data usage threshold within 7 days to the free data day." ➢Use N250 or more on voice calls. Tuesday 31st of October is the day.